Reds Apple E Juice There are 18 products. Reds Apple by Reds Apple EJuice Crisp Sweet Red Apple Juice. Reminiscent of your favourite boxed apple juice. Reds Apple Iced by Reds Apple EJuice A chilled refreshing iced apple juice straight from the freezer on a hot summer day. Reds Grape by Reds Apple EJuice Reds Grape is a refreshingly crisp sweet red apple juice with tantalizing grape, a classic twist on the Reds Apple ejuice. Reds Grape Iced by Reds Apple EJuice Experience the freshening blast of ice with a perfect blend of the classic Reds ejuice and tantalising grape. Reds Watermelon by Reds Apple EJuice Reds Watermelon is a refreshingly crisp sweet red apple juice with tantalising watermelon, a classic twist on the Reds Apple ejuice. Reds Watermelon Iced by Reds Apple EJuice Experience the freshening blast of ice with the perfect blend of the classic Reds ejuice and tantalising watermelon. Reds Berries by Reds Apple EJuice A tangy blend of blueberry, raspberry, and pomegranate paired with the iconic Reds apple juice. Reds Berries Iced by Reds Apple EJuice A chilled and tangy blend of blueberry, raspberry, and pomegranate paired with the iconic Reds apple juice. 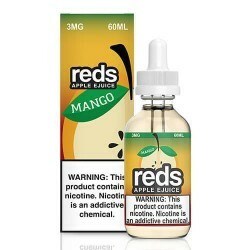 Reds Mango by Reds Apple EJuice A tangy blend of mangoes paired with the iconic reds apple juice. 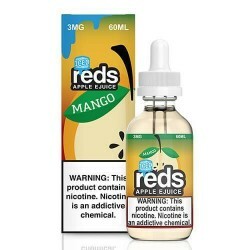 Reds Mango Iced by Reds Apple EJuice Experience the freshening blast of ice with a tangy blend of mangoes paired with the iconic apple juice.